I have to be honest: I’m somewhat of a masochist when it comes to Sonic the Hedgehog. Wait, no. That’s not right. “Masochist” implies there’s pain caused to me, but that’s not accurate at all: my experience playing any of the almost universally-reviled 3D Sonic games couldn’t be further from painful. They bring me joy. They bring me sustenance. They bring me life. All right, now I’m just being silly. But there’s an awful lot of stigma that comes attached with saying you honestly enjoyed a game like Shadow the Hedgehog or what’s colloquially known as Sonic ’06. You know, the kind of stigma that would compel someone to say they’re a “masochist” rather than, say, outright admit they like games that are objectively flawed in many serious ways. And I do. I love both of those games, and the Adventure titles, and Heroes, and Unleashed, and pretty much whatever the other ones considered bad are. I’ve played ’em all, and I love ’em. I mean no disrespect when I say this, either. There’s no pseudo-hipster liking these games “ironically” for me. I started out my preview this way because I wanted to establish that I’m not one of those folks who feels obligated to act as though each new Sonic title has the burden of the series’ reputation on its shoulders. And no disrespect to those people, either. The series has had serious issues for a long time now. And I guess I do too, considering how much I like the very worst of them. As funny as it is to laugh at all this stuff is, though, the truth is that Forces is shaping up to be one of the more polished and fun entries in the series as of late — though it hasn’t been declared a sequel to Generations, its blend of Modern Sonic/Classic Sonic gameplay (now with the addition of Original Character antics) very much feels in line with that game’s well-received formula. Boosting? Check. Wisps? Check. Switching perspectives from 3D to 2D in back in Modern Sonic and the Original Character’s levels? That’s here, too. Additional challenges in the form of the deviously hidden Red Star Rings? Mm-hmm. The differences, then, lie in the smaller changes: level and boss design, slight mechanical alterations, and so on. As far as the former goes, if the three levels I played are any indication, Sonic Team have outdone themselves in the creative and fun platforming department. There’s still nothing quite like the high-speed boosting game mechanics the team invented for Sonic Unleashed’s day stages, then went on to perfect in Colors and Generations. The Forces stages I played furthered this mastery, hitting that sweet spot between unfair trial and error (which isn’t there) and forcing things to slow down to get some platforming in. Well, okay, there’s still some of that last bit going on, but it feels less intrusive than it did in Generations, for what it’s worth. 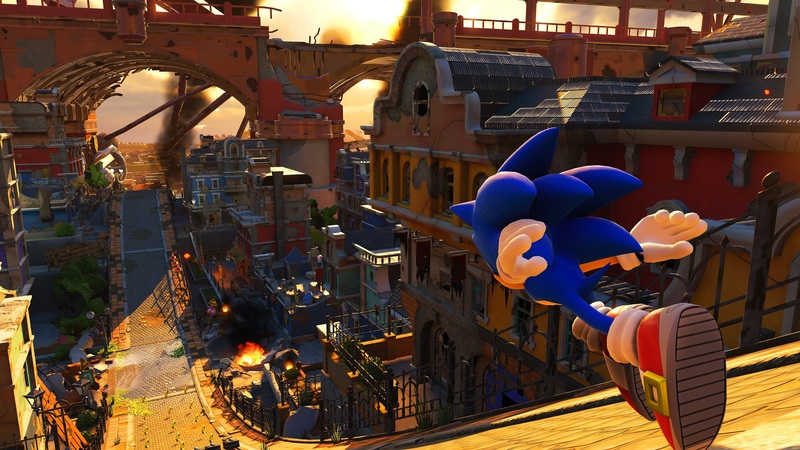 I still feel like it throws off my flow when Modern Sonic transitions from 3D to 2D, and I’m not sure why it’s necessary to do that given that we already have fully-2D stages in the form of Classic Sonic’s offerings. But whatever — these are still stages that get better and more satisfying each time you play them, tempting you to do things just a little bit speedier. Dare I say it? You gotta go fast, man. There is one somewhat strange alteration to a mechanic that’s been the same for the last two decades of the Blue Blur’s history, and I wonder how longtime fans will take to it. When damaged, rings no longer fly out of Sonic in a manner that lets you collect them again; instead, whether you’ve got 1 ring or 1000, your count drops to 0 (in most cases, but I’ll get back to that later), and you have no ability to mitigate the risk. According to two of the developers who I spoke to after playing, this change was made to re-balance the difficulty in the absence of a life counter … so in other words, it’s a bit easier to die now, but you have unlimited chances to try again from whatever checkpoint you left off from. I’m not sure this is a particularly sound design choice from a “fun” perspective — it means that carefully collecting just one ring at a time during boss battles is now objectively the best strategy, which I personally find tedious, but I’ll reserve final judgment until I’ve got my hands on the finished product. The big thing left to talk about, then, is those original characters — some of whom are also the only way of bypassing the weird new ring rules. You see, there are seven basic animal types you can base your OC on in Sonic Forces, and each has a different power that can really switch up the feel of the game. Since character creation wasn’t available in the demo I experienced, I had to play as a pre-created “cat” model character — whose ability is always retaining one ring when hit (unless, of course, there isn’t one ring to retain). In the final version, there’ll be a dog that begins with five rings every time they have to restart a level, wolves that act as ring magnets, birds that can double jump and so on. Needless to say, as silly as some of these characters are inevitably going to be, I think it’s a fun and creative idea and — combined with some of the fun level design I played — will add quite a bit of variety to what’s already shaping up to be a solid platformer. 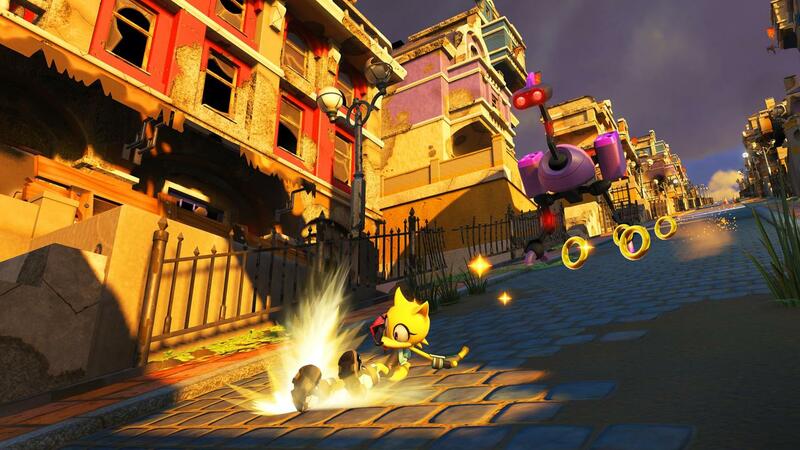 Sonic Forces is slated to launch later this year for PC, PS4, Xbox One and Nintendo Switch, and I’m quite looking forward to it. But hey, I’m the guy who thinks “I Am (All of Me)” is a wonderful song in a downright wonderful game, so take that for what it is.